The abduction and disappearance of 43 young Mexican students in September 2014 provoked mass popular protests across the country. Amid reports of corrupt collusion between local politicians, police, and drug gangs, President Enrique Peña Nieto pledged to hold those responsible to account. Yet today, questions about what happened to the students still fester in Mexico’s body politic. Allies of families of the victims—who were all students of the Ayotzinapa teacher training college in Guerrero state—have staged a protest vigil outside the federal prosecutor’s office in Mexico City. An independent assessment of the investigation, delivered in April by a group of international experts, concluded that federal officials had mishandled evidence, ignored important leads, and tortured numerous suspects to secure confessions. Ultimately, the Ayotzinapa case has laid bare a deeper national crisis of atrocity and impunity in Mexico. For three years, the Open Society Justice Initiative and five Mexican partner organizations have sought to understand the dimensions and nature of this crisis. Our report, Undeniable Atrocities: Confronting Crimes against Humanity in Mexico, considers the escalation in violence since the end of 2006, when the federal government ordered the large-scale domestic deployment of security forces to combat organized crime. We conclude that there is reason to believe that federal government and organized crime groups—specifically, members of the Zetas cartel—have committed murder, torture, and disappearance that have been widespread, systematic, and part of a policy to attack civilian populations. In short, there is a reasonable basis to believe that some of these atrocities amount to crimes against humanity (which the above video in Spanish explains in more detail). Mexico’s government has pursued a legitimate goal: subduing organized crime fueled by guns and demand for drugs from the north. But it has done so by authorizing overwhelming extrajudicial force against civilian populations perceived to be associated with criminal cartels. There has been no adequate regulation on the use of force, and almost no accountability for abuses. Mexico’s army, navy, federal police, and the attorney general’s office have victimized not only actual cartel members, but innocent bystanders and many falsely accused of criminality. The victims include Jorge Parral, a bridge administrator kidnapped by criminals, then shot point-blank by the Mexican army and buried as a cartel hitman in April 2010. They include shopkeeper José Fortino Martínez, dragged by navy forces from his house in June 2011 and never seen again. And they include a 20-year-old kidnapping survivor who was tortured, then prosecuted for organized crime because in June 2014 she witnessed the army’s summary execution of over a dozen people at Tlatlaya and then refused to support the state’s fabricated story of a shootout. Forces at Tlatlaya were acting on an explicit order to kill. There have been no criminal convictions for these atrocities or many others. Only one soldier has ever been convicted of enforced disappearance, and from 2007 through April 2015, there were only six federal convictions for the crime of torture. Mexico is a middle-income country rich in human capital. Technical shortcomings in the justice sector exist largely by design or neglect. The roots of impunity are political. Successive governments have sought to deny and minimize the extent of the crisis, including by falsely blaming victims of criminality, attacking those who draw attention to the crisis, and obscuring data on the extent of atrocities. For example, the federal government has made few efforts to understand how many clandestine and mass graves there are in the country. Further, the federal government—despite public protestations to the contrary—has in practice encouraged or accepted the use of torture by prosecutors and police, sought to protect the army and navy from proper criminal investigation, and pursued militarized forms of policing that leave the force prone to committing crimes and unskilled at investigating them. Federal prosecutors have reclassified crimes as lesser offenses, tampered with or fabricated evidence, and mired unwanted cases in labyrinths of bureaucracy. When pressure has grown, the government has launched initiatives and reforms with great fanfare, only to starve them of resources and political support. The International Criminal Court (ICC) could assert jurisdiction over crimes against humanity in Mexico, but Undeniable Atrocities is not a call for ICC jurisdiction. Rather, by identifying the obstacles to justice, the report aims to assist Mexico in overcoming them and fulfilling its obligation to genuinely investigate and prosecute the crimes. There are significant reforms to Mexico’s justice system currently underway. Yet these and more specific initiatives to deal with atrocity crimes are slow-moving, and come in the context of active political obstruction and serial reform failures over decades. Undeniable Atrocities argues that the federal government must take extraordinary steps to deal with an extraordinary crisis that threatens future development of the country: it should invite an international commission authorized to independently investigate atrocities and grand corruption, and to introduce cases in Mexican courts. Mexico’s leaders can break with policies of denial and obstruction, and begin to build Mexicans’ long-absent trust in the justice system. 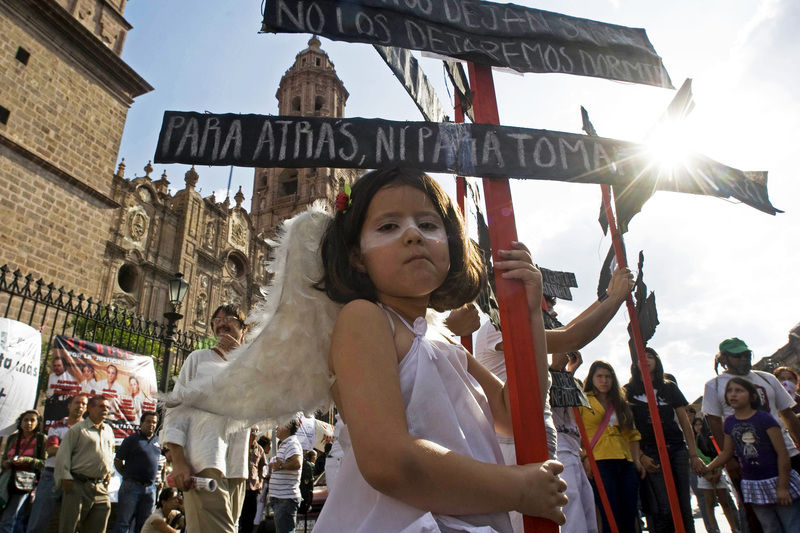 Doing so will be critical to ending Mexico’s epidemic of murder, disappearance, and torture. This entry was posted in Latin America, Social antimafia human rights and tagged human rights, justice, Mexico, organized crime, violence. Bookmark the permalink.